Gamilaraay man Raymond ‘Bubbly’ Weatherall is at the Redfern Community Centre. On this Friday night in early June, rain smashes down outside as he recounts how his countryman Nathan Leslie threatened to arrest police, who’d come to arrest him for trespassing on his own land. Weatherall’s audience has just watched the outstanding documentary ‘Sacrifice Zone’ on anti-fracking struggles against the Santos Narrabri Gas Project in north western NSW. The police backed off and left, Bubbly gleefully tells the audience. Huge struggles up to 2015 reduced the percentage of NSW open for fracking from 60 per cent to 5 per cent till, as the documentary states, “all that is left is Santos land.” Work has begun on Gomeroi land in the Pilliga. The battle is Australia-wide. Only Victoria, which has banned it, Tasmania and the ACT are currently unaffected. According to Guardian Australia’s Michael Evershed, “The vast majority of land in both the NT and South Australia is covered by either current tenements for petroleum exploration and development, or applications for exploration and development,” leaving them vulnerable to shale gas mining. 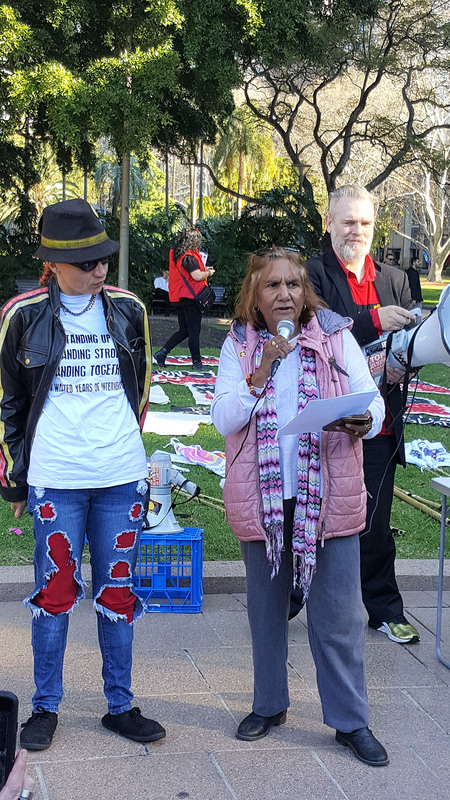 When the ALP mis-government recently approved 51 per cent of NT for shale gas mining and fracking it became clear that Aboriginal lands are being particularly targeted. Before the go-ahead, NT First Nations’ youth group, Seed, stated, “Over 60 community members from across 13 regions came together on Larrakia country in Darwin, 18-20 November 2017, to yarn about how to stand together and stop fracking from destroying the NT. “Never before have this many Aboriginal community members been brought together on the issue of fracking. This spearhead of powerful opposition ensured 135 requirements were promised, but the fight is not over by a long shot. Shale and coal seam gas mining creates huge amounts of poisoned waste water and can contaminate rivers up to 1000km away. Borroloola’s McArthur River has already been poisoned by mining giant Glencore using conventional mining. “We want this land to be strong and healthy for our children so they can go out bush hunting and fishing in the clean environment. Our water has to be clean and healthy for everyone to drink,” she says. To the east, the Great Artesian Basin (GAB) covers an area the size of Queensland, straddling four states. Once contaminated, underground resources like GAB which communities rely on into the future, damage can’t be undone. In Queensland, producing gas fields already cover more than 30,000 square kilometres. The results are laid bare; industrialisation of rural and remote areas by an insidious, deceitful and destructive industry. Those affected have begged Australia to listen and learn. Struggle reveals the bloodless icy heart of capitalism; that only profits matter. The interests of the people and those of giant corporations are diametrically opposed. Those on the front line of struggle will never look at capitalism in the same way again. Many begin to sense that this antagonistic and irreconcilable contradiction needs a final resolution. Stop Chinese capital’s new coal-fired plants in Australia!